I am prepping my kitchen for some Mexican fiesta this week. I am all geared up for week full of burritos, quesadillas, nachos and what not ! Lately a visit to my Mexican friend’s place refreshed my memories of this amazing poblano sauce i once had.. it was simply delicious ! !Here is my first attempt at making that very sauce. Sharing my experiences of making my first Poblano Cream Sauce. Poblano peppers is a mild chili pepper originating in the state Puebla in Mexico. These are usually dark and bright green in color with a shiny exterior. Often mild in flavour, these peppers can have significant heat as well. They are eaten both dried and fresh. As fresh, they can be cooked with onions and made into fajitas, stuffed, fried or used in various sauces. I have tried the stuffed version and that is delicious to core ! It is very recent that one of my Mexican friend called us over for a Mexican feast and there it was ! I was just so thrilled. I immediately asked my friend to give me the recipe for the sauce and show me a sample of the poblano peppers. Yesterday when i was grocery shopping, i happen to find these peppers and i grabbed a few ! Obviously i would not have missed the opportunity 😛 So, now that i have my peppers, why waste time ?? Let’s hop on to the recipe right away !! 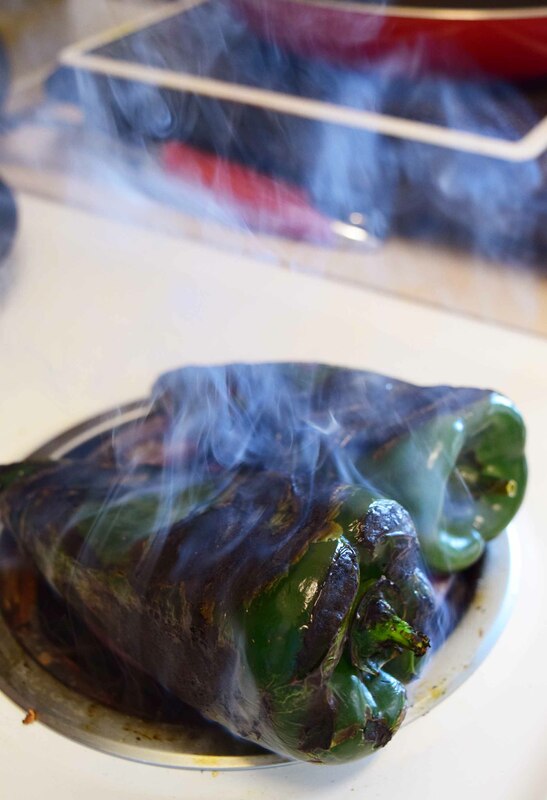 Begin with roasting the Poblano peppers. I have a coil based stove so i used that but u can do so on the barbecue grill or on the open flame. This step will take approximately 7-10 minutes. It is best not to use oven for this as we are looking at charring the peppers. Once the peppers are charred, remove from flame and keep aside till it gets cold. After that, peel the charred skin off the peppers. Dice the peppers (you may like to wear gloves while handling the peppers) and discard the seeds from inside. Now, take a skillet. Add in oil and heat it up. Add in the chopped onion and garlic cloves. Saute till the onions are translucent. Add in the diced peppers and saute for a couple more minutes. Let the mixture cool down. Blend this mixture with milk and cream till smooth. Sprinkle salt and pepper on top and combine. Add more milk for a thinner consistency. 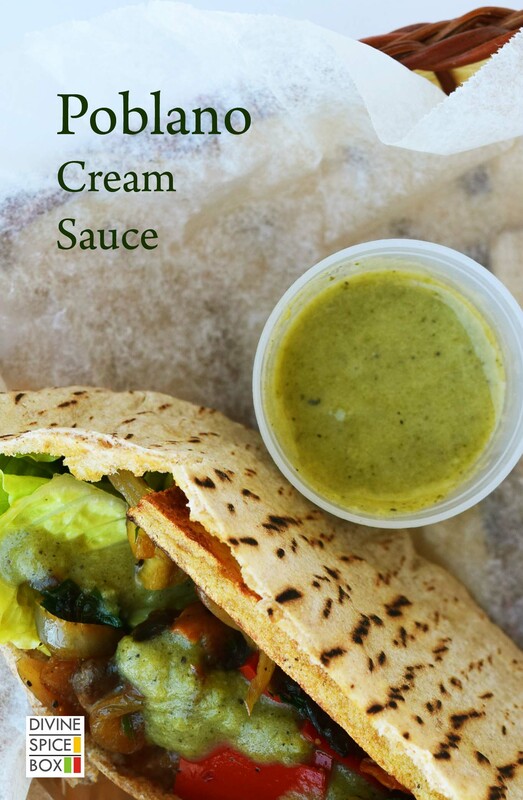 The Poblano creamy sauce is ready. Now that is one snazzy sauce which can go on top of so many things !! I have tried this with sandwiches, burrito bowls, omelets/ frittata, Tamales, fried rice and what not 🙂 I am pretty much falling in love with it and though my kitchen smells spicy and charred for an entire day, i am so going to make this sauce as soon as i get over with the current batch ! You go ahead and make this sauce soon too !! Tagged charring, creamy, Dips, Mexican, mildflavour, peppers, Quick, roasting, sauces, Snack. Thanks Elaine..yeah took me a couple of shots to capture the smoke !